Natural Interpreters don't take notes. Indeed many of them, being young children, can't write or read yet. This limits the chunks of speech they can translate at a time to a sentence or two. At least as a rule; in a later post I'll mention an intriguing exception. Native Interpreters may know to take notes and how to do it. If they know how, it's because they carry the skill over from some other educational or work activity. The first time I had to do long consecutive, it was for an after-dinner speech of thanks at a banquet and I hadn't been trained for it nor even forewarned. Nonetheless, I didn't trust my memory and I took the precaution of finding a blank page in the programme and borrowing a pen from another guest. Why did I know to take notes and how did I know how to do it? Undoubtedly from years of taking notes in class and at lectures, and from recording proceedings in order to write the minutes of meetings. Thus I knew to pick out the key ideas in the message and to record them in a mixture of ordinary longhand and abbreviations – a by-product of education that has proven useful to me on several occasions. But I lost a lot of the detail – it was a ten-minute speech and the programme page wouldn't have held more than I wrote – and so I had to fill in with what Expert Interpreters call winging it. Still, since the speech was just polite rhetoric, I got by. For Expert Interpreters, it's a more highly developed skill, and it's taught as a subject in 'classic' interpreter training programmes. First, students are told not to try to record in shorthand. Taking shorthand fast enough – up to 150 words a minute – and furthermore reading it back fluently, is a trained skill in itself. Instead they are taught to use a 'concept notation' of graphic symbols, 'speedwriting' and spacing, in which a given concept is always represented by the same symbol or abbreviation whatever wording has been used to express it. The layout of the notes on the page is also meaningful. 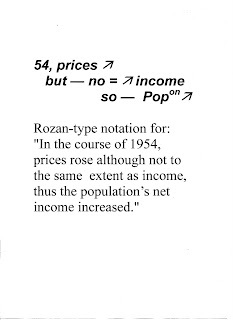 With the classic training goes a classic manual from the days when consecutive was the standard mode of conference interpreting: it's the one by Rozan (see References). 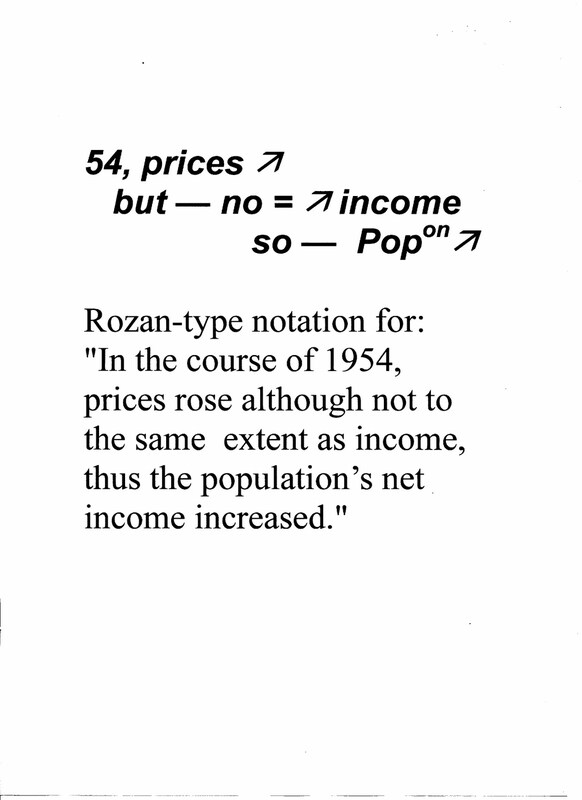 Nobody I worked with used Rozan exactly as is, but students can extract from it and substitute whatever symbols of their own they feel comfortable with. What's essential is the principle of noting concepts and not words. Nor need the notes be complete; they're only a prop and a stimulus for the memory, and it may be that the interpreters themselves can't reconstitute the speech after a lapse of time. There's a famous research thesis by Seleskovitch based on conference interpreters' recall from their notes (see References). For expert notetaking, it's important that the notepad be of the type used by reporters and shorthand secretaries, easily held in one hand or perched on one knee, with pages that can be flipped over quickly, and that it have a hard back. Finally, there's one additional skill that's often overlooked in the training programmes. It's the ability to take notes and translate from them standing up and 'on the trot' instead of sitting comfortably in a classroom or a booth. Jean-François Rozan. Note-taking in Consecutive Interpreting. Krakow: Tertium Society for the Promotion of Language Studies, 2005. Translated by Andrew Gillies from the French La prise de notes en interprétation consécutive, 1956. There are other systems, and there's a whole literature on this topic. Danica Seleskovitch. Langage, langues et mémoire; étude de la prise de notes en interprétation consécutive. Paris: Minard, 1975. For more on the author, enter Seleskovitch in the Search box at the top of the right-hand column. Winging it. In interpreter's jargon, it means filling in for something that wasn't heard or wasn't understood, or that the interpreter has forgotten or simply can't translate. To be successful, i.e., to go undetected, it must be something that the speaker might have said. More about it some other time. Image: Interpreter Training Resources, "the only dedicated site for students of conference interpreting". http://interpreters.free.fr/. 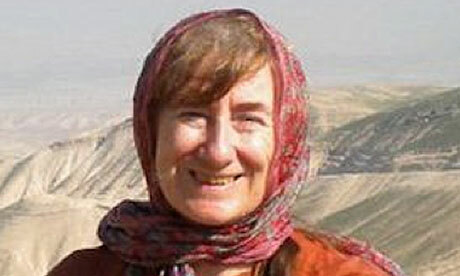 You may have seen that the Englishwoman, Mary Gardner (see photo), who was killed in the Jerusalem bus bomb blast this week, was a Bible translator. She was a humble working member of the Wycliffe Bible Translators network, one of the biggest translation organisations in the world. For more about them in previous posts, enter Wycliffe in the Search box at the head of the right-hand column. It was a tragic case of being in the wrong place, for she was far from her usual habitat, Togo in West Africa. There she had translated the New Testament into the local Ifé language. She hadn't gone to Jerusalem just to visit the Holy Land, though a firsthand acquaintance with Palestine is certainly useful background material for a Bible translator. Bible translators need to be Expert Translators. The Wycliffe translators usually arrive on the job as Native Translators who are well acquainted with the model of religious translation that the Bible provides in English but have some gaps in their training to fill in. In Mary's case, she'd gone to Jerusalem, like St Jerome many centuries earlier, to learn Hebrew in preparation for translating the Old Testament. Conal Urquhart and Caroline Davies. Jerusalem bomb victim was British bible translator studying Hebrew. Guardian Unlimited, March 24, 2011. The annual Valencian Falles festival (in Spanish, Fallas) ended at Saturday midnight in its traditional apotheosis of fire, fireworks and thunderclaps. The biggest thunderclaps had roared all week like artillery barrages. It's a peculiarity of the Valencians that they're brought up to take childish delight in loud noise. The minority who can't take it flee the city for the week. But now calm is restored and it's possible to think again. Expert Interpreters will have immediately recognised the significance of that. All interpreting requires short-term memory in order for the interpreter to keep in mind what the speaker has just said. For simultaneous interpreting, which is never really quite simultaneous, it's a matter of up to three seconds. Short consecutive interpreting needs longer, depending on the span of the ‘chunks’ into which the original is segmented. Long (or full) consecutive may require a much longer memory span, commonly three to five minutes but up to half an hour or more in extreme cases. “The end of the era of the consecutive system in the United Nations had its glorious moment. The noted Latin-American statesman and orator, Señor Fernando Belaúnde of Peru made at the General Assembly a long political speech in Spanish which was translated into French by one of the famous brothers [Georges and André] Kaminker. M. Kaminker reproduced every significant phrase, every telling pause, every emotional tone and even every dramatic gesture, and, having used no notes at all, sat down amid a thunder of applause." Indeed André Kaminker had eidetic (photographic) memory. He was undoubtedly helped by the fact that long consecutive was the standard method used in conference interpreting in his time, and so his generation got a lot of practice at it (see Image below). Jesús Baigorri-Jalón. Interpreters at the United Nations: a History. Translated from Spanish by Ann Barr. Salamanca: Ediciones Universidad, 2004. See pp. 46 ff. for a biography of André Kaminker. Available on Google Books. The description of André Kaminker’s feat at the United Nations comes from Lord Gore-Booth’s introduction to Satow's Guide to Diplomatic Practice, 5th edn., London, Longman, 1979. Image: André Kaminker at work in Paris in 1949. He's the man in the light suit at the far right of the table listening intently to the speaker in the middle. Photo by Nat Farbman for Time, Inc.
For more on the Japan disaster through an interpreter who knows the country and its culture intimately, go fast to today's post on Lionel Dersot's blog The Liaison Interpreter. It's an illuminating and corrective first-hand description of interpreting performed by an Expert and by probably Native Interpreters (one of them a lawyer) on the spot in Sendai. It's in English, and there's a direct link to it at Liaison Interpreting in Japan in the column to the right. I refrain from posting an image of flattened Sendai. Alas, you’ve probably seen enough of them. Today and tomorrow, March 17-18, a symposium is being held in Montreal to commemorate the work of Wallace Lambert. The programme is available at acpi.ca/documents/5077_AEC_programme_an_V5.pdf. He was the McGill University psychology professor whose research helped to dispel the fear, predominant in Canada at the time, that early bilingual education would slow down children's linguistic and other cognitive development. He and his colleagues showed quite the contrary. That made him early on receptive to the idea that children could translate. A brief tribute to him was posted on this blog shortly after his death in 2009. You can retrieve it by entering Lambert in the Search box to the right. I was thinking of something for this blog when the news of the Japanese earthquake started to come in and absorbed all. The news – a lot of it in translation of course: Japanese TV feeds and press conferences with text in Japanese and English voiceovers (we were watching CNN). Then the tsunami – a Japanese word (literally harbour wave) that has been adopted into English. And now the nuclear 'incidents'. "all work has vanished or is about to thin out in the atmosphere like a deadly cloud. The only possible work so far is to accompany foreign TV crews. They want to go North. They are scrambling to find 'language helpers'. Some dare ask for interpreters." "The shock was fluid. I was at the post office in south Mita, having left some clients just five minutes earlier. The second shock, which came when I was on Hibiya Avenue itself, was no less scary, like being on a moving pavement. 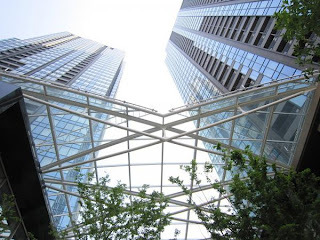 Many people were looking in great alarm towards the glassy Sumitomo building [see photo], which was twisting and reflecting another building that was doing the same thing. Buildings that reflect are nightmares." "Outside the hardest-hit regions, Japan is funtioning or will soon be functioning again... The sound of the delivery boy pushing the morning newspaper through the letter box is a sign that services are normal." Meanwhile, the members of a professional network, Freelance France Japon, are offering their services on a voluntary basis for people who are experiencing communication problems. Thank you, Lionel, for keeping us posted. Lionel Dersot. The Liaison Interpreter. http://japaninterpreter.blogspot.com/. Lionel Dersot. Tokyo: journal de résidence au Japon. http://tokyo.blog.lemonde. The International Association of Conference Interpreters (AIIC) runs a well-maintained website, but its content is produced by and addressed to Expert Interpreters, so it's usually outside the scope of this blog. However, there’s a report currently posted there that has an implication for all interpreting. Successful communication depends primarily, of course, on the ability of the interpreters. Nevertheless, it also depends heavily on the conditions under which the interpreting is done. In the case of consecutive and sign language interpreting, for example, the interpreters must be placed where they can hear and see the speakers clearly and where the audience can hear and see them, otherwise it's a waste of time and talent. For simultaneous interpretation, the audio equipment must be of top quality. If conditions are poor, the effect will be at the very least more stress on the interpreters, and inconvenience for the listeners. In posts about the Shafia hearing in Canada last year [you can find them by entering shafia in the Search box at top right], I quoted a crime reporter's description: "A sound-deadening booth that was dubbed the garden shed by lawyers was erected near the prisoner's box..." In other words, a temporary booth of a kind that is 'sound-deadening' but not soundproof; so that the interpreter's voice can be heard by people nearby, which is distracting for them. At the extreme, the conditions may render interpreting impossible. The report I'm quoting now is of a far more VHP (Very High Profile) trial, with the presence of foreign as well as domestic press. Indeed the crime that gave rise to it was so high profile that its repercussions brought down the Spanish government. "On 11th March 2004, bombs which had been placed on commuter trains in Madrid exploded during the morning rush hour, killing 191 and wounding over 1500 people in what was one of the worst terrorist attacks ever to be perpetrated in Europe. The attacks were attributed to Islamic extremists, arrests were made and the trial took place from February to June 2007. Given that many of the 29 defendants and some of the 650 witnesses were native speakers of Arabic and Berber with a limited or no command of Spanish, interpreting was required throughout the proceedings." "A top Foreign Affairs Ministry interpreter was commissioned to put together the interpreting team... The interpreting team was prepared months beforehand and utmost care was taken to ensure that the interpreters working at this high profile mega-trial were experienced, trained, professional conference interpreters with knowledge of the different dialectal variations of Arabic and Berber spoken by the defendants and witnesses." In this last respect, those responsible had done better than at the Shafia hearing, where insufficient attention was paid to the difference between dialects of Farsi. Conference interpreters were called on in Madrid instead of regular court interpreters because court interpretation in Spain (as elsewhere) is normally done in consecutive mode, whereas on this occasion a decision had been taken to use simultaneous interpreting, to which conference interpreters are accustomed. But there's the rub. The interpreters were used to simultaneous interpreting; not, however, the court administration, who were ignorant of the technical conditions needed for it. Chaos ensued. "From the first day, problems became evident. Although great financial investment had been made in equipment for simultaneous interpreting, headphones had only been purchased for the non-Spanish speaking defendants, enabling them to follow the interpreting into Arabic. The interpretation of their testimony into Spanish for the court was broadcast through loudspeakers in the courtroom. The disadvantage of this system was that the interpreters not only heard the voice of the defendants and witnesses that they had to translate, but they also heard their own interpretation through the loudspeakers in the courtroom which was picked up by defendants’/witnesses’ microphone and fed back into their headphones. Obviously such a system is totally inadequate and extremely off-putting for the interpreters, making their already difficult task almost impossible. One may wonder why indeed they carried on and did not stop the proceedings until the sound problems had been resolved. This possibility was indeed discussed but ruled out at the time, given the tremendous expectation surrounding the trial, particularly on the first day of the hearings. There was an atmosphere of great tension as all public attention in Spain and indeed in many other countries was focused on this trial, with the presence of more than 400 journalists from all over the world, live television coverage and webcast, the presence of victims and their families and over 50 lawyers. The interpreters decided to carry on, adapting their technique by lengthening the time lag between what they heard in Arabic and their rendering in Spanish, which meant that they were not, strictly speaking, interpreting in the simultaneous mode. By the afternoon, tension was running high and the presiding judge began to make critical comments about the interpreters: 'The interpreters are not having a very good afternoon'… 'I want simultaneous interpreting, not successive [sic] interpreting'. He finally suspended the hearing, demanding to see the interpreters immediately in his office. These scenes were broadcast live on Spanish television and gave interpreting a very visible profile from day one of the trial, although, unfortunately for our profession, the judge’s disparaging comments and unjustified criticism of their performance did not portray the interpreters’ work in a very favourable light. Like the judge, the general public is not familiar with the technical requirements for simultaneous interpreting and was unaware of the extremely difficult working conditions the interpreters had found themselves in. These sound problems were partially solved as a result of the meeting between the interpreters and the judge, and the latter subsequently apologized for his comments and grew to greatly appreciate the work done by the interpreters. This evolution, however, was unbeknown to the general public and the media, whose opinion remained coloured by the public comments made on that first day in court. It is interesting to note that AIIC was among the professional organizations and colleagues who publicly spoke out in defence of the interpreters in the media." Poor conditions had not rendered interpretation completely impossible, but had come very close to it. In this instance, the interpreters were Expert Interpreters and the context was VHP. In true Natural Translation, the conditions may be uncontrollable because the translation occurs spontaneously. However, in all the more sophisticated forms of interpreting, the principle of providing adequate conditions cannot be ignored without penalty. I hear there's a new European Union code of court interpretation in the works. Hopefully it'll have a section on technical and working conditions. Anne Martin and Juan Miguel Ortega Herráez. 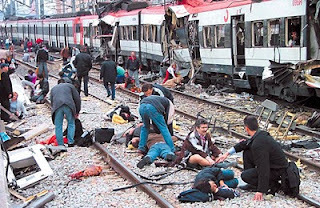 Nuremberg in Madrid: The Role of Interpreting in the Madrid Train Bomb Trial. AIIC, Winter 2011. http://www.aiic.net/ViewPage.cfm/article2629.htm. In my last post I said I'd write something about the grey market in conference interpreting (CI), because it attracts and provides work for Native Interpreters. Let's start at the beginning. I began in CI in Canada in 1970. By that time , almost all of it was being done in simultaneous interpreting (SI). I'd had some experience at consecutive interpreting and I'd heard some SI, but I'd never done it. Nevertheless, I approached a reputable translation agency in Montreal and asked them to give me a chance. They put me in an SI booth and played me a 15-minute tape as a test. It was such an ordeal that I still remember what the speech was about. They knew at once that I was inexperienced – I was 'jerky', as they put it – but they happened to need an interpreter so badly that they gave me an assignment. It was really not a job for a beginner: a three-day university conference on the History of Music. Fortunately I had a week to prepare. Thus, at the very start, I experienced two freelance CI markets. One was the upscale Expert Interpreter market. I call it the AIIC market, because in those days AIIC fixed the rates for it and was capable of blackballing interpreters who didn't respect them. It was a price maintenance practice that has since been made illegal in Canada and the European Union by competition legislation, though there continue to be other factors that keep the rates high. The other was a market that admitted unqualified and less experienced interpreters and paid them roughly half the AIIC rate: the grey market, as the AIIC interpreters called it. Nevertheless, having worked in both, I can say that there were some very competent interpreters on the grey market, and if they weren't at least minimally capable they didn't last long. They included many part-timers; and even Expert Interpreters when they couldn't find enough work at their own level. In my view the grey market was bound to exist because of the high cost of Expert Interpreters and because there was at times a shortage of them. When I retired in 1989, the Expert Interpreters were already charging $600 a day. 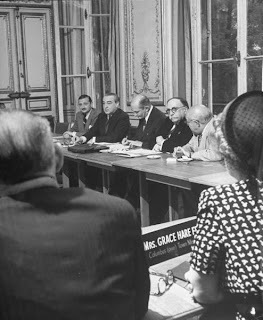 Furthermore, the AIIC working guidelines required two, and in Canada even three, interpreters for each team (each booth, in professional jargon), with a booth for each language involved. Work it out for a meeting with, say, three languages. And that's not counting the cost of the equipment and technicians needed for SI. Large meetings, governments and rich organisations could bear it; however, there were many small, cash-strapped organisations that couldn't although they needed interpreters. NGOs, student bodies and neighbourhood associations were good examples. I phrase all this in the past tense because I've long since retired, but I've no reason to think the picture has changed much. So the grey market flourished. There was one grey market agency in Montreal, founded by a trade union official, which was so successful in the 1980s that its owners sold out after a few years and retired to Chile. I readily confess I occasionally worked for them for $250 a day, and so did some of my students on my recommendation. It was a good way for students to get on-the-job practice and gain confidence in what was reputed to be a difficult market to break into. International Association of Conference Interpreters. http://www.aiic.net/. Brian Harris. The need for several standards of conference interpretation. (Paper to the 1st International Congress on the Assessment of Quality in Conference Interpreting, Almuñecar, Spain, April 2001). In Ángela Collados Aís et al. (eds. ), La evaluación de la calidad en interpretación: docencia y profesión, Granada, Comares, 2003, vol.2, pp.3-16.